Duluth, Minnesota is a gorgeous port city across the bay from Superior, Wisconsin. Duluth, MN is a haven for outdoor enthusiasts looking to work and play in the same community. A well-known tourist destination, Duluth offers ample attractions. Duluth, MN offers a variety of opportunities for visitors and residents alike. 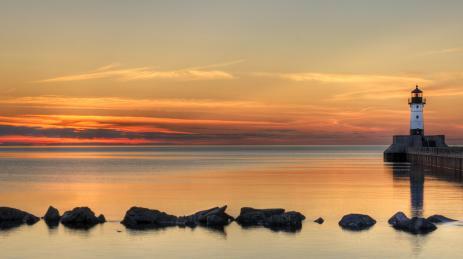 Here are a few things we love about Duluth! Duluth, MN Parks and Recreations is an extensive park system within the city limits. Amenities include playgrounds, picnic tables, baseball fields, hiking trails and skating rinks. Many parks offer winding creeks with waterfalls and gorgeous wooded acres. Use the park finder tool to locate parks near you. An extensive biking system and trail system are also in place in Duluth. Trail systems include the Hawk Ridge Trail, the well known Superior Hiking Trail which runs 310 miles from south of Duluth to the Canadian border, and the Lakewalk which runs over 7 miles from Bayfront Park to Brighton Beach. This paved trail offers hiking, running and biking options with access to bike rentals, shopping and dining. Park Point jets into the bay toward Wisconsin and is accessed through Canal Park over the Lift Bridge. The area offers numerous summer activities including beaches and sand volleyball courts. Summer also offers paddleboarding, golfing, alpine slides, white water rafting, boating/kayaking, charter fishing and rock climbing. Winter offers snowmobile trails east and west of Duluth, downhill and cross country skiing, dog sledding, ice climbing and snowshoeing.